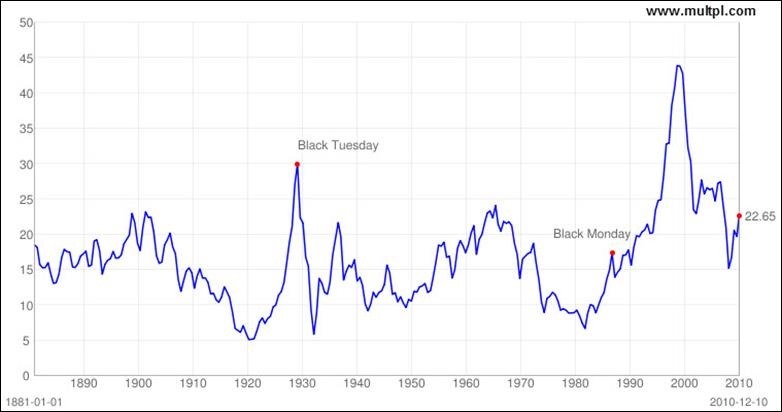 In the “decades” timeframe, we are in a Secular Bear Market which began in 2000 when the P/E ratio (using Shiller’s Cyclically-Adjusted P/E) peaked at about 44. 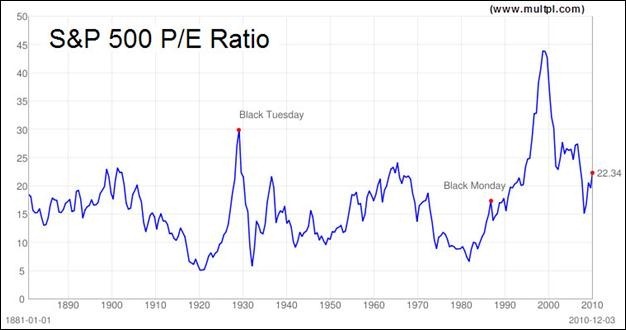 The job of Secular Bear markets is to burn off outrageously high P/E ratios over one or two decades, until finally the P/E ratio arrives back at a single-digit level, from which another Secular Bull Market can emerge. See Fig. 1 for the 100-year view. We are nowhere near the end of this Secular Bear Market, as the P/E is now about 22.3 (see Fig. 2 – a snapshot of http://www.multpl.com). Even though P/E’s are now just half what they were at their crazy peak in 2000, they are nonetheless at the very high end of the normal range and leave little if any room for expansion. This means that the stock market is unlikely to make gains greater than corporate profit growth percentage, if that. In fact, since 1881, the average annual returns for all twenty year periods that began with a P/E at this level have ranged from -2%/yr to +7%/yr with an average of just 3%/yr. This further means that above-average returns will only be available to actively managed portfolios. Buy and Hold is dead money in these circumstances, and is likely to remain so for years to come. The average duration of a Secular Bear Market is 17.6 years, and we are but 11 years into the current one. 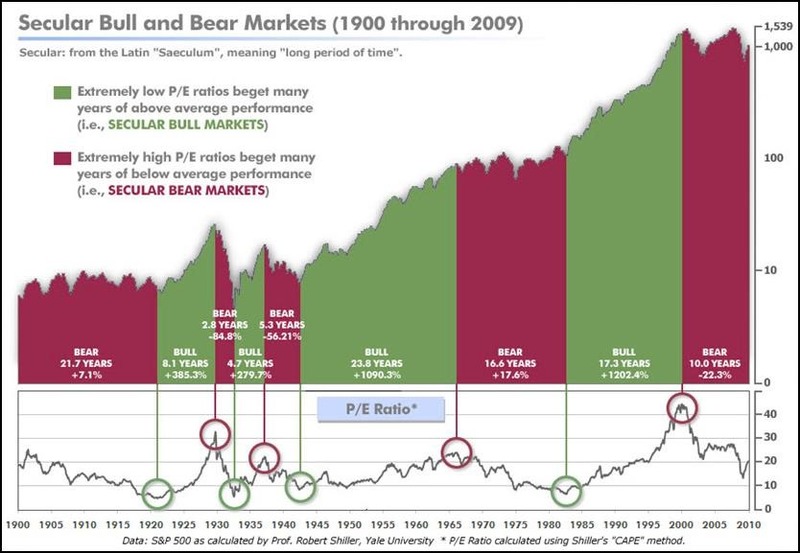 In the “years” timeframe (the timeframe monitored by our Bull-Bear Indicators), we are in a Cyclical Bull Market which began in May of 2009 in the US market, when the rally off the March lows of the preceding Cyclical Bear Market of 2008 and early 2009 proved itself to be more than a Bear Market rally, and morphed into the first leg up of a new Cyclical Bull Market. Cyclical Bull Markets can last for several years even within a Secular Bear Market – for example, the Cyclical Bull Market that ran from early 2003 through 2007. The current Cyclical Bull Market is a year and a half old now, but there is no guarantee that it will last any particular duration. The Bull-Bear Indicators show that this Cyclical Bull Market is strong, but currently exhibiting readings that are near the top end of the range of Cyclical Bulls. If one is able to identify and take advantage of the Cyclical Bull Markets within a Secular Bear Market, quite satisfactory returns can be achieved even when the overall market goes nowhere or down. That is what our indicators and models are built to achieve. The current value of the US Bull-Bear Indicator is 73.95, up for the second week after three prior down weeks, and solidly in Bull territory. See Fig. 3. In the “weeks to months” timeframe (the timeframe monitored by the Shermanator), we are in a positive condition, and have been for several months. After the recent 4% pullback, a new push up has taken many indices back to their highs of the year, or higher. The Shermanator did not go to “red” status during this pullback, as the number of sectors in “demand” mode remained higher than 30 throughout the pullback. The Shermanator gained 2, to 34, in the week. See Fig. 4. The expectation for a pullback within a Cyclical Bull Market is that it should last several weeks to several months, should go sideways to somewhat down but not catastrophically down, and that it will eventually give way to the next leg up in the ongoing Cyclical Bull Market – which is then expected to reach or exceed the prior highs. 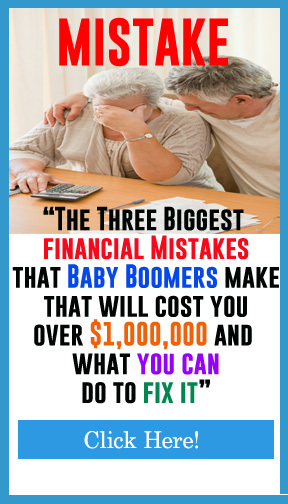 This expectation is fulfilled time after time after time in an ongoing Cyclical Bull Market…until the very last pullback, which morphs into the first leg down of a new Cyclical Bear Market – and the job of our Bull-Bear Indicators is to detect that event! Of course, we can’t know in advance which pullback is the very last pullback in an ongoing Cyclical Bull Market, so we treat each as if it is not the last one, until it proves otherwise. It was a quiet week on the international front, with no new “shoes” dropping among the PIIGS countries of Europe, and no new tightening from China. With no exceedingly bad international news to demand attention, the ongoing mostly good US economic news took precedence and the US market held the prior week’s big rally, adding an additional 0.25% – 2%. Many indices and styleboxes – small, mid, growth in particular – reached new highs for the last 2 or more years. Within the US, Growth is more in demand than Value, with demand spread across all 3 cap-size growth styleboxes, plus mid- and small-cap blend styleboxes. LargeCap Growth demand is focused on the Tech area more than other components of LargeCap Growth. Even small- and mid-cap value styleboxes are ranked “Above Average”, completing the dominance of small- and mid-cap over large-cap. See Fig. 5. Because of the recent turmoil in International markets, both Developed and Emerging categories have remained lower ranked than most US styleboxes. The “four horsemen of defense” – the SHUT sectors (“S”=Staples [a.k.a. consumer non-cyclical], “H”=Healthcare, “U”=Utilities and “T”=Telecom) – are all in the “Below Average” area of the Sherman Sheet p. 1 ranking table (Fig 5). The sectors most sensitive to a growing economy – the DIME sectors (“D”=Discretionary [a.k.a. 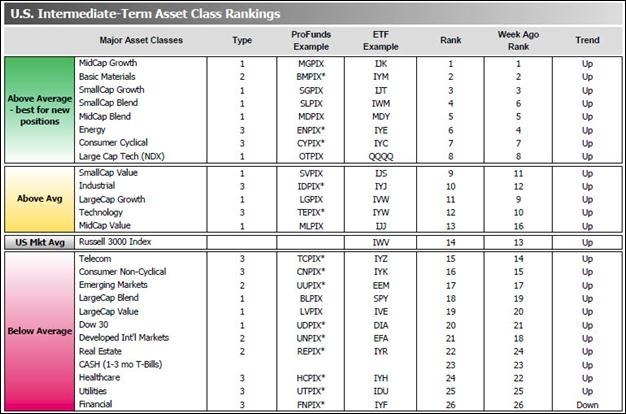 consumer cyclical], “I”=Industrial, “M”=Materials, “E”=Energy) – are all in the “Above Average” area of the p. 1 ranking table. 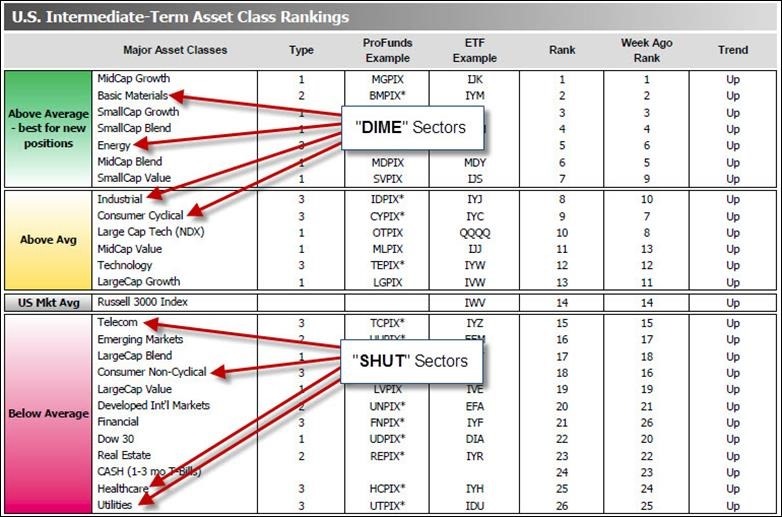 This condition – “DIME” ranked higher than “SHUT” – reflects the majority stance among institutional investors that the economy is growing and defensive positioning is not currently warranted. Though it can change in short order, this positioning is common during decent uptrends and reflects the expectation among institutional investors that the uptrend is established and intact. In summary, we are in Cyclical Bull mode within a Secular Bear, and now recovered from a modest pullback in the weeks-to-months timeframe. We expect that this Cyclical Bull will carry on – with pullbacks enroute – until the Bull-Bear indicator shows it has ended. We have no expectation as to the remaining duration of this Cyclical Bull, but confidence that our tools will detect its end in a timely and effective manner. Because we are in a Secular Bear, we have no expectations of runs of multiple double-digit consecutive years, and we expect a return to poor market conditions sometime down the road. Nonetheless, we remain completely open to any eventuality that the market brings, and our strategies, tactics and tools will allow us to successfully navigate whatever happens. Cyclical Bull Markets can last for several years even within a Secular Bear Market – for example, the Cyclical Bull Market that ran from early 2003 through 2007. The current Cyclical Bull Market is a year and a half old now, but there is no guarantee that it will last any particular duration. The Bull-Bear Indicators show that this Cyclical Bull Market is strong, but currently exhibiting readings that are at the top end of the range of Cyclical Bulls. The current value of the US Bull-Bear Indicator is 72.42, up after three down weeks, and solidly in Bull territory. See Fig. 3. The Shermanator did not go to “red” status during this pullback, as the number of sectors in “demand” mode remained higher than 30 throughout the pullback. See Fig. 4. Internationally, Ireland has agreed to an EU bailout, while Portugal and Spain maintain such bailouts aren’t needed. Should Spain require a bailout, the magnitude would strain the capacity of the EU and the IMF combined. It seems that the markets are willing to ignore the European situation until one or another country teeters on the brink. China’s attempts to rein in its inflation continue to dominate the Asian news, with bets being made on both sides of whether they can achieve a “soft landing”. With no exceedingly bad international news to demand attention, the ongoing mostly good US economic news took precedence and the US market rallied 3-4%, recovering the ground given up in the pullback. Because of the recent turmoil in International markets, both Developed and Emerging categories have remained lower ranked than most style boxes. In summary, we are in Cyclical Bull mode within a Secular Bear, and just recovering from a modest pullback in the weeks-to-months timeframe. We expect that this Cyclical Bull will carry on – with pullbacks enroute – until the Bull-Bear indicator shows it has ended. We have no expectation as to the remaining duration of this Cyclical Bull, but confidence that our tools will detect its end in a timely and effective manner. Because we are in a Secular Bear, we have no expectations of runs of multiple double-digit consecutive years, and we expect a return to poor market conditions sometime down the road. Nonetheless, we remain completely open to any eventuality that the market brings, and our strategies, tactics and tools will allow us to successfully navigate whatever happens.